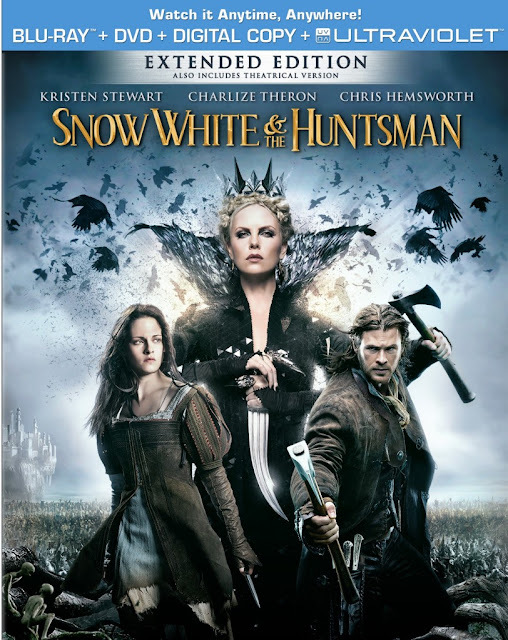 In the epic action-adventureSnow White and the Huntsman, Kristen Stewart (Twilight) plays the only person in the land fairer than the evil queen (Oscar winner Charlize Theron) out to destroy her. But what the wicked ruler never imagined is that the young woman threatening her reign has been training in the art of war with a huntsman (Chris Hemsworth, Thor) dispatched to kill her. Sam Claflin (Pirates of the Caribbean: On Stranger Tides) joins the cast as the prince long enchanted by Snow White’s beauty and power. 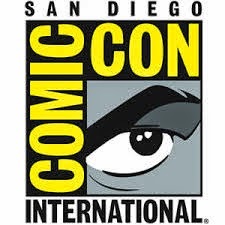 The breathtaking new vision of the legendary tale is from Joe Roth, the producer of Alice in Wonderland, producer Sam Mercer (The Sixth Sense) and acclaimed commercial director and state-of-the-art visualist Rupert Sanders. The second Snow White movie of the year releases on Friday June 1st. The first, Mirror Mirror, was the lighter side of the story, with Snow White and The Huntsman certainly representing the dark side. 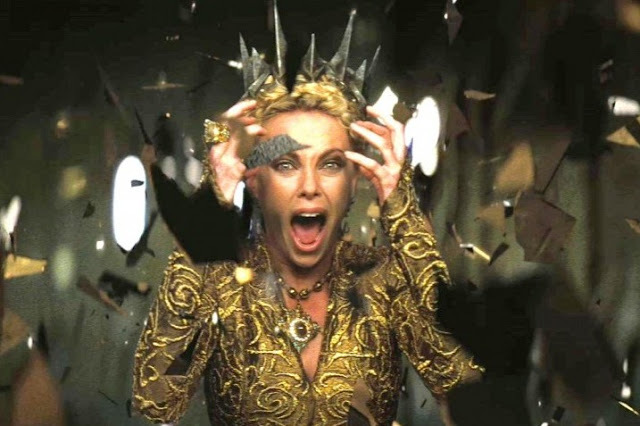 Charlize Theron stars as the evil queen, desperate to keep her beauty and her magical powers. Kristen Stewart is the young and beautiful Snow White. I’m happy to report that the key elements of the Snow White story are there – the magic mirror, the poison apple, and of course the dwarves. The magic mirror is not a traditional mirror, but it does its job answering when the queen asks “mirror mirror on the wall, who is the fairest of them all.” For years, the mirror tells the queen that she is the fairest until Snow White comes of age. In more ways than one, Snow White is an immense threat to the queen. She sends her dutiful brother to the tower Snow White has been locked in, to take her life. Snow White escapes the grasp of the Queen’s brother and runs into the dark forest. The queen must find someone brave enough to track Snow White into the dark forest, where most men won’t venture. 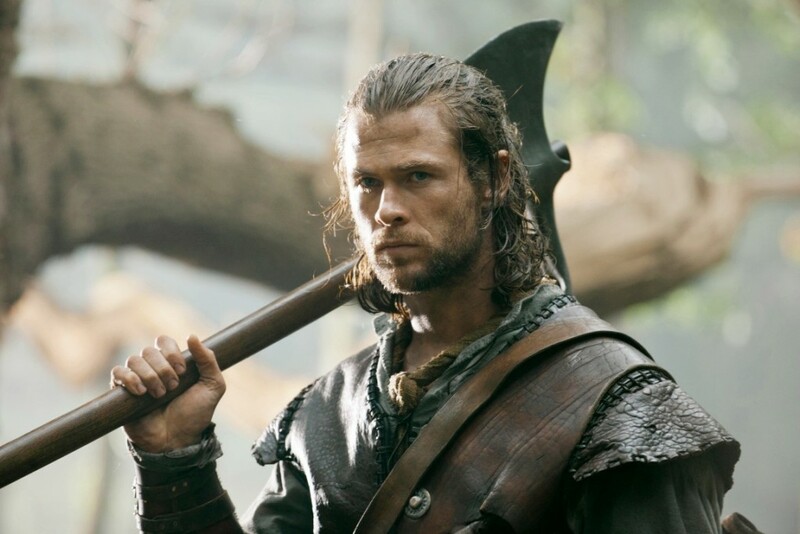 Chris Hemsworth plays the dirty, but handsome Huntsman. The Queen promises to use her powers to bring his wife back in exchange for retrieving Snow White. 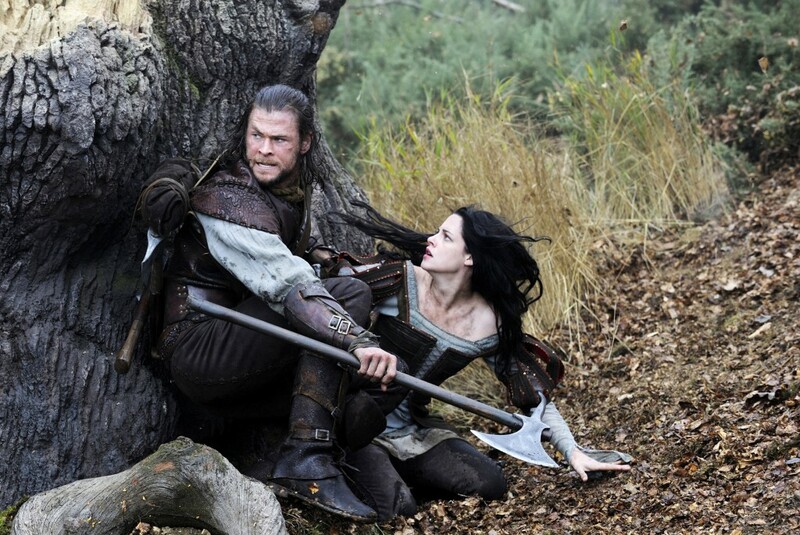 There are a lot of things that I liked about Snow White and the Huntsman. First of all, I applaud seeing the dark side of the story. This is definitely an adult movie. It’s visually very interesting and has a lot of unique effects. Charlize Theron does an excellent job playing the Queen. She plays the character with just the right about of evil and vulnerability. Kristen Stewart is not one of my favorite actresses but she makes a decent Snow White. I absolutely loved Chris Hemsworth and his Irish accent as the Huntsman. While I loved Chris Hemsworth’s accent, I couldn’t figure out Kristen Stewart’s. It sounded as though she was attempting a British accent but couldn't quite pull it off. The things I didn't like are minor details. The girl who played the young Snow White was very cute, but had brown hair. If you’re going to play Snow White at any age I feel like you are required to have jet black hair. Maybe there are rules against dying the hair of young actors, but if that is the case I would have suggested they keep looking for an actress with black hair. The queen’s brother was a little beyond an acceptable level of creepy and I could have done without him in the story at all. I left out a lot of the details, so as not to spoil it for my readers. Snow White and the Huntsman has a lot going on, and it’s almost as though it is written specifically to set up a sequel. Some of the plot points aren't the way I would have gone with the script but this was still an enjoyable movie overall. This 1080p (2.35:1) transfer is gorgeous and it looks even better on Blu-ray than it did in the theaters. Colors pop off the screen in all of their vibrant multi-hued beauty. Every location is given its own distinct appearance that offers a wide variety of tones and colors to appreciate. From the Queen's shiny black kingdom to the mossy and forbidding Dark Forest, this movie looks incredible. Detail is extremely sharp with honed textures and every seam, hair, and scar on display in exquisite detail. Skintones are natural and persistent and the black levels are pitch black and solid. I didn't notice any kind of digital defect or blemish to detract from the picture. This is an outstanding transfer and fans will be very pleased. Snow White and the Huntsman's DTS-HD Master Audio 7.1 mix is also as amazing as the video quality. This lossless mix is demo-worthy with its all enveloping surround sound that takes advantage of every channel to bring the movie to life. This is one of the most atmospheric movies I've heard on Blu-ray with each location providing its own sonic thrills. I especially liked the scenes in the Dark Forest and the sounds of the creepy trees. The film's directionality is simply amazing as whatever action you see onscreen, is accurately reflected in the sound design, so you will hear the arrows whiz by. Dialogue is crystal clear too , with every voice easily understood and never drowned out by all of the action. This is one of the best lossless mixes I've heard and it's so good that it made the film even more engrossing to me as it felt as if I was there. The film's extras are also all very good although a bit brief in their running time. I also liked how Universal generously gives you a digital copy, an ultraviolet copy, and a DVD copy, so there's something for everyone. I hope other studios follow Universal's lead on that. Theatrical Version and Extended Edition - There's two versions of the film included, a 127-minute theatrical cut and a 131-minute extended edition. The four extra minutes don't really offer a huge difference, but I always go with the extended edition version myself. Audio Commentary - A fairly comprehensive commentary with director Rupert Sanders, visual effects supervisor Cedric Nicolas-Troyan, and co-editor Neil Smith. They talk about just about every aspect of the film's production including, casting, making the movie, designing the look of the film, the special effects, and more. U-Control, Picture in Picture - Once you've seen the movie and want to learn more about the film, you can check out this picture in picture track that offers short views on the making of the film, interviews with the cast and crew, and a bunch of looks behind the scenes during filming. Second Screen Experience - This is another way to get more in depth information while watching the film. If you download the pocketBLU app, you can join in on an interactive experience while watch it play. Around the Kingdom: 360° Set Tour - This was a cool extra as we get to see the film's sets that were built in the legendary Pinewood Studios that have been reconstructed from panoramic photographs which include "King Magnus' Courtyard," "Village Near Castle Tabor," "Duke Hammond's Castle Encampment," "Queen Raveena's Throne Room" and "Queen Raveena's Mirror Room." A New Legend is Born - At over twenty minutes, this is a pretty in depth look at the making of the film with director Rupert Sanders, producer Joe Roth, and the rest of the cast and crew. This covers similar territory as the commentary and the picture and picture track but this one is a good overview. Reinventing the Fairy Tale - A look at the various iterations of the story and Rupert Sanders proof of concept for the film. Citizens of the Kingdom - This includes four different EPK featurettes - "Fairest of Them All: Snow White," "Deliciously Evil: Queen Ravenna," "The Huntsman" and, the best of the bunch, "Motley Crew: The Dwarves." The Magic of Snow White and the Huntsman - A look at the film's special effects. I expected to dislike Snow White and the Huntsman and was pleasantly surprised with the film as a whole. Most of what sold it for me was Charlize Theron’s spot on portrayal of the Evil Queen. As far as I’m concerned she carried this film and is responsible for any success it has. I loved Chris Hemsworth in the film and Kristen Stewart did a good job in not ruining the film, which is what I had anticipated. This Blu-ray is stellar with incredible audio and video quality and some really good extras so it's an easy one to recommend!